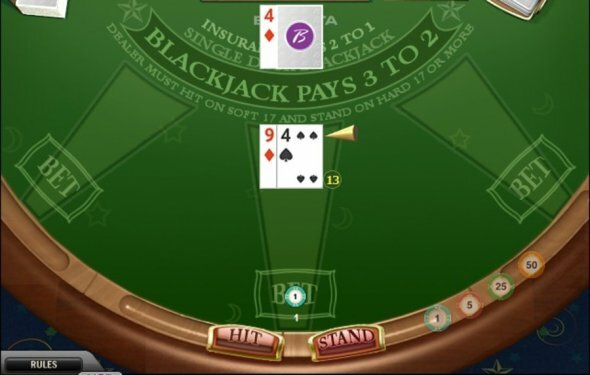 I get quite a few emails from players asking where they can play single deck live blackjack online. The fact that players are looking for this variation online is understandable since all other things being equal, blackjack dealt from a single deck offers better player returns (for optimal play) than games dealt from multiple decks. And the difference is substantial – dropping from eight decks to a single deck adds almost 0.5% to expected player returns. It’s probably for this reason that as of right now, you will not find an online casino offering single deck live blackjack. The common offering is similar to what you’ll find on the Vegas Strip – 8 deck shoe, dealer stands on soft 17, double permitted after split and blackjack pays 3:2. Not bad returns (fraction under 99.5%) but not in the same league as single deck. A couple of casinos deal from a 6 deck shoe – but the difference between 6 and 8 decks is marginal. Another prohibitive factor associated with dealing from just the one deck is the need for constant re-shuffles which adds casino overhead. Playtech deal their Live Casino Holdem’ game from a single deck and have to staff the table with 2 dealers…one dealing the game, and the other shuffling a second deck ready to be played as soon as the other is depleted. I guess this is an overhead the operators/platform providers are happy to wear on a higher house edge game. On a game with no/limited house edge I doubt they’d be so keen. Card Counting in Single Deck Blackjack!